There are many different types of growing media you can use in your aquaponic system, though there are a couple of things to watch out for. Firstly there’s the rock or particle size, we prefer to use a media that is between 8mm and 16mm, there are some disadvantages if you go very far out of this range. If the media is a lot smaller then there’s not a much air space between the media when it’s in your bed. If the media is a lot larger, your surface area is markedly reduced, plus planting becomes a lot harder. Your choices are to go for a hydroponic expanded clay or alternatively you can use a local crushed rock media. You want to be a little careful with the rock you choose as some can have high levels of limestone and other high pH minerals within them which can lead to nutrient lock out. Other types of rock media are probably available locally for you, things like river-stone, shale , scoria and many others. Some people have found that their local crushed rock or gravel media can have a high pH level, a classic example of this is limestone, which can cause you’re pH to go very high. High pH can be a bit of a problem in an aquaponic system so if you are unsure, a quick way to check any rock you are thinking of using is to do the vinegar test. Get a handful of the media you want to use, drop it into a jug or cup of normal household vinegar, if the rocks appear to be visibly bubbling, releasing bubbles from the rock, then chances are it has a high pH and best if you can look at an alternative. Rock media or gravel is also very heavy so you need to plan to have enough support for it when building your growbeds and their stands and supports. The advantages of rock media is that it’s readily available and usually very cheap. Expanded clay is extremely light, pH neutral, comes in handy bags, it’s easy to plant in, easy to clean and sterile. However it’s downside, usually very expensive. You will need to weigh up the pros and cons yourself, if you want quick and money is not the most limiting factor, then expanded clay is the go, if you are more concerned about cost and you’re willing to spend a lot more time on constructing stronger supports and moving and cleaning your media, then go for the rock. Some people like to take the middle road, you can fill the bottom of your bed with gravel/rock then fill the top half with expanded clay, this cuts the costs significantly, also cuts the weight, and makes sure that you have a nice media for planting and harvesting in. 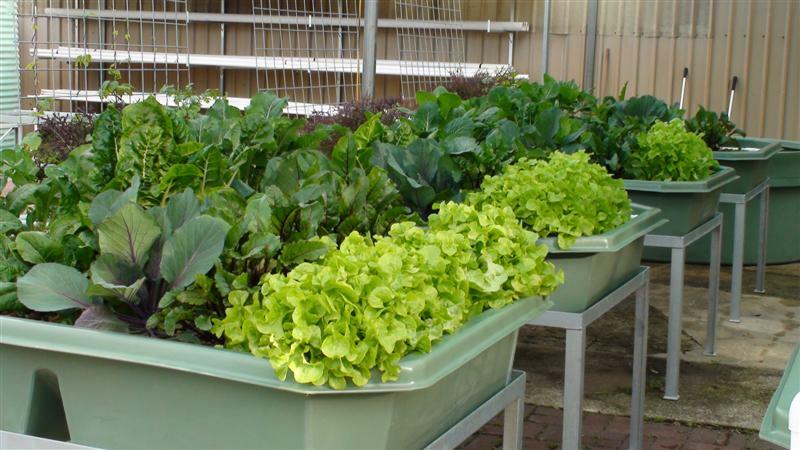 Edition 3 of the Backyard Aquaponics Magazine has the results of our trial testing the 4 different growbed media mentioned above, there’s also lots more general information about what to look for with growbed media you may have in your local area.